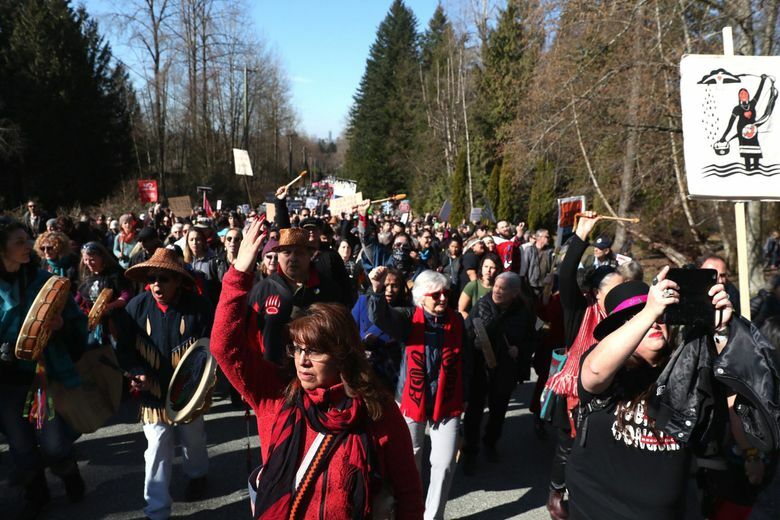 Developer Kinder Morgan got a court order to force demonstrators to keep their distance and indigenous leaders vow to dig in for the long haul. Pipeline giant Kinder Morgan obtained a court order on the eve of Saturday’s massive civil-disobedience demonstrations in metro Vancouver, B.C., to force protesters to keep their distance. Several workers on the tank side of the fence could be seen monitoring the activities. The temporary injunction, granted by the British Columbia Supreme Court, gives the Houston-based company the ability to call for the arrest of any person within 126 feet of its property on Burnaby Mountain. 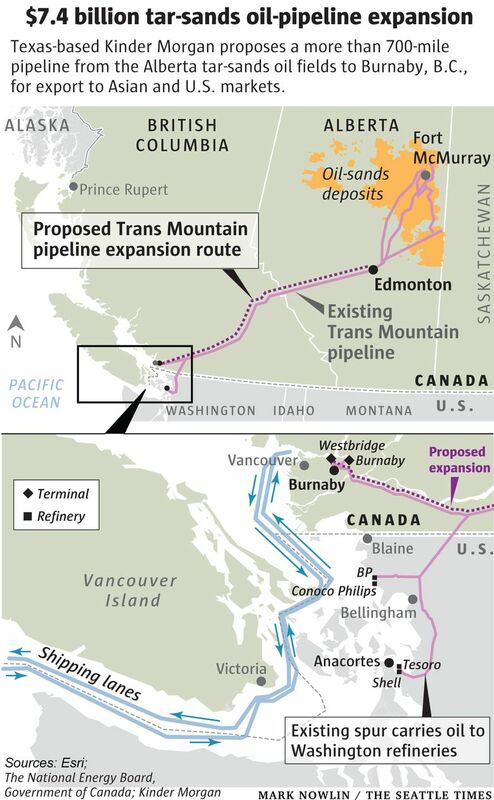 The company intends to build 14 more tanks at its tank farm at the base of the mountain and three more berths at its marine terminal near the tank farm, and it wants to bore a tunnel through the mountain for a new pipeline that would nearly triple the volume of diluted bitumen oil from Alberta’s tar sands to the Pacific Coast for export. 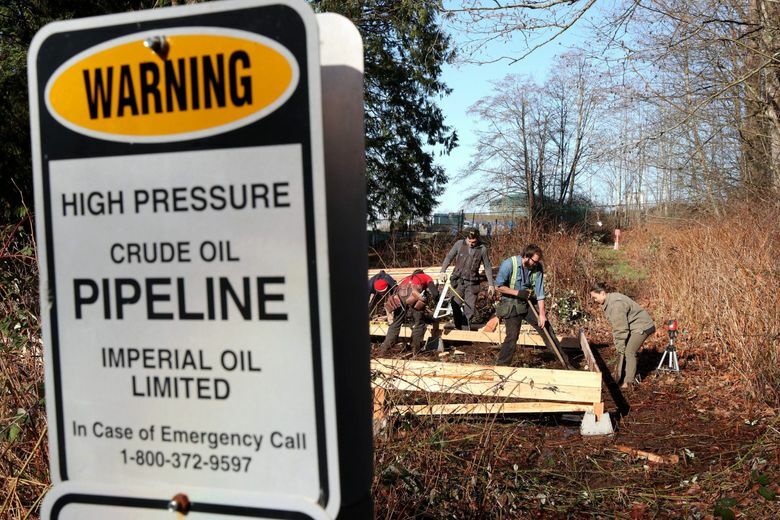 The project is fiercely opposed by governments and communities all over British Columbia and beyond, and arrests already were occurring this week, as opponents obstructed roads and gates leading to Kinder Morgan’s property at the base of the mountain. Workers were delayed in some tree cutting the company has underway on the mountain in preparation for the tunnel bore, causing the company to seek the protection of the injunction, according to Kinder Morgan’s filing. Indigenous leaders poured into Vancouver on Friday from across Canada, and thousands of people were on the streets Saturday. Leaders vowed not a one-off march but a stand for the long haul, with plans to build Kwekwecnewtxw (“a place to watch from”), a structure on unceded indigenous land of the Tsleil-Waututh people. The Watch House is a cultural touchstone for First Nations communities that in aboriginal times would build a structure from which to keep watch for enemies, said Will George, a Tsleil-Waututh Nation member and spokesman for Protect the Inlet. The long-term movement to block the pipeline will launch Saturday with the march and building and occupation of the Watch House. 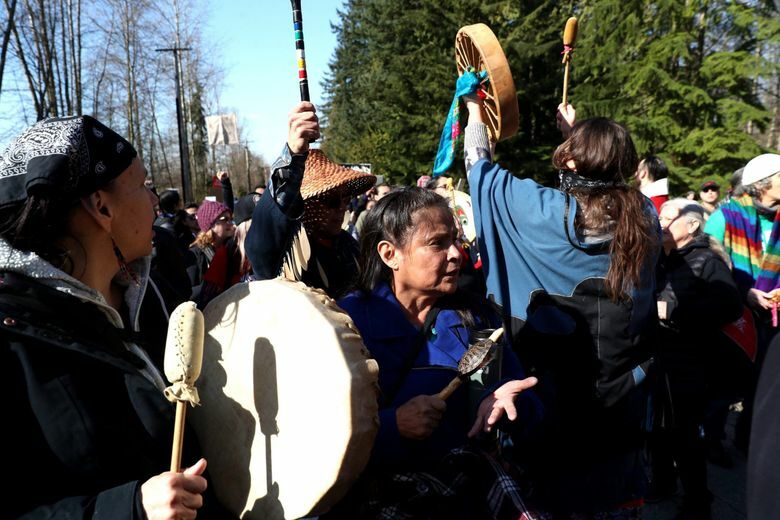 Tsleil-Waututh elders and spiritual leaders have called for the grass-roots opposition movement by First Nations members and their allies, to complement the lawsuits and formal opposition by First Nation, municipal and provincial governments to the project. “There is no jail, there is no injunction, there is no military force or police force that will deter us from protecting the rights and interests of our grandchildren,” said Grand Chief Stewart Phillip of the Okanagan Nation and president of the Union of British Columbia Indian Chiefs, representing 118 First Nations in a Friday news conference in Vancouver about the march. Kinder Morgan has received permission from both the National Energy Board and the federal government of Canada to build the pipeline to carry diluted bitumen oil from the oil sands of Alberta all the way to the Salish Sea at Burnaby, to load it on tankers for export. The project is staunchly supported by Prime Minister Justin Trudeau, saying it is in the national interest. 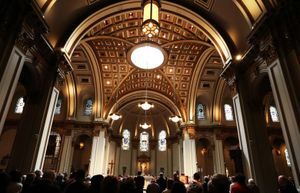 Backers of the project will stage a rally of their own on Saturday in downtown Vancouver. The $7.3 billion project is planned to twin an existing line in use since the 1950s that includes a spur to Washington state refineries. 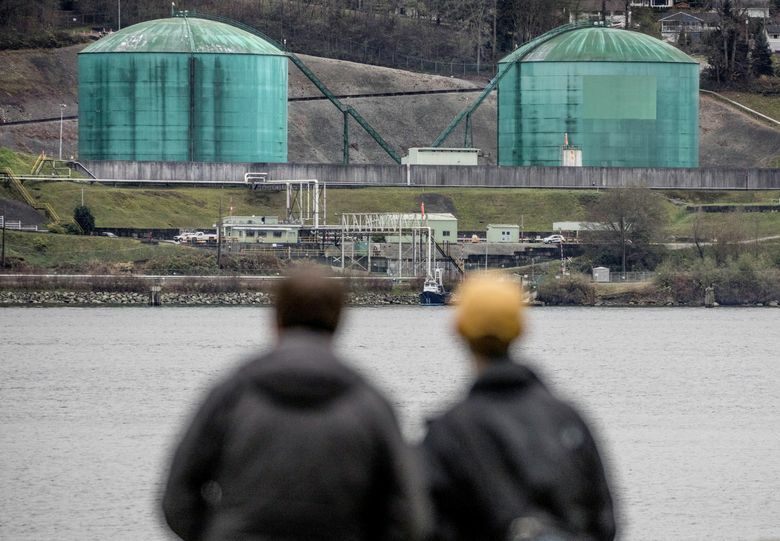 Kinder Morgan wants the line finished by December 2020 to meet shippers’ demand and hopes for higher export prices by exporting to Asia and other overseas markets, rather than selling to the U.S.
At Burnaby, the company intends to enhance its Westridge Marine Terminal to serve seven times the oil-tanker traffic carrying oil from the pipeline expansion to markets. The company says it has agreements with all First Nations whose land the new pipeline will traverse. But indigenous leaders strongly disputed that in the news conference Friday. A hearing will be convened next week on whether to continue the restraint on demonstrators’ right to peaceful assembly on public roads and parks that abut the company’s property. Opponents, including Stand.earth, claim the order unlawfully limits nonviolent public protest. Amy George, an elder and spiritual leader at Tsleil-Waututh, said her people, the People of the Inlet, “could not sit back. “I can’t keep quiet. I have to stand up and speak as a member of my community.” Her traditional name of Ta-ah means grandmother, and George said she will be on the front lines Saturday. 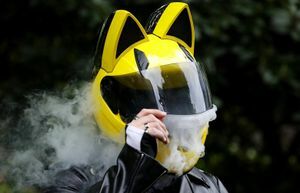 The Associated Press contributed to this report from Vancouver, B.C.